Discussion in 'Miscellaneous' started by batmegh, Jun 27, 2012. Yeah, you're having issues way before choosing safe mode. buy geek squad support it cost $20 for a month and then take your pc to a best buy there they will fix everything. That's it! Nice idea taking a picture of it. definetly not an ancient pc. BobTheTomato9798, Manglex and battmeghs like this. Wait before you take the computer apart try this! So it sounds like the computers running fine and the monitor just isn't connected properly. Check the monitor's connection,. I'm assuming that's been tried already. Obviously she's rebooted and tried some of the other "is it plugged in" level problems. Can you show us a picture of the DVD drive from the inside of the case? not very easily, my phone wont take a clear picture of it, it either blurs, the flash floods it out, or there isn't enough light to see it. Ok. There should be 2 cables coming out the back, Sata power and Sata data. Unplug both of those and then plug them back in. When you turn the computer on does it beep? If the tower speaker is connected to the motherboard it will beep. The amount and frequency of the beeps will indicate what the problem is. If it beeps how many times and how far apart are they? The beeping is a debug for the motherboard that will help isolate the problem. Alright, Massive derp! >.< I just thought the CD rom's dead. It's the whole computer? it doesn't beep at all. and i am not sure..
Look around on the motherboard for any burn marks. it's how I found out mine was dead. 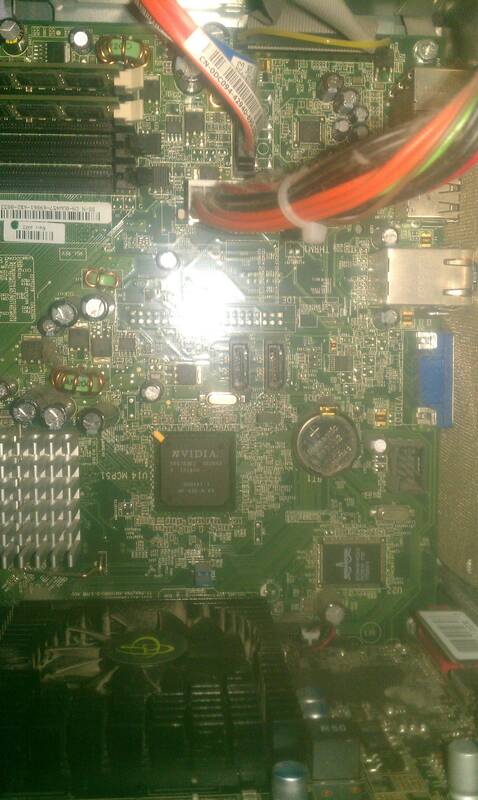 well moose got it to turn on, and it works fine, the only thing now is that the disc drive wont work. Have you checked all the cables?